The 126 film cassette (trademarked by Kodak as "Kodapak") is a plastic film magazine containing film 35mm wide, spooled with a paper backing. This lacks the continuous sprocket holes found in conventional 35mm film; instead there is a single index hole to register the position of each 28×28 mm frame. With the cassette film, you don't have to attach the film leader to a take-up spool. The cartridge simply drops into the camera. Since the cassette is asymmetric, it cannot be loaded incorrectly. You close the back, wind, and shoot. 126 cameras have a window to show the back of the cassette, which is printed with the film details, and has a small hole revealing the frame number printed on the backing paper. The inventor, Hubert Nerwin, was granted US patent 3,138,081 on June 23, 1964. The patent was assigned to Eastman Kodak. At the end of the roll, you don't have to rewind. Even if you remove the cassette in mid-roll, only the current exposure is light-struck; the rest of the film is protected inside the cartridge. It also incorporated one of the first widely-used mechanical film-speed sensing systems; using notches on the cassette, a speed of 64, 80, 125 or 160 ASA was indicated and set the camera's exposure mechanism. However, not all cameras took advantage of this feature. Kodak patents decades earlier (for example: 2186611 (1938), 2186613 (1937)) described this innovation. 126 film is 35mm wide and has a single perforation per frame. The image size is nominally 26×26mm, though actually it is 29×28mm masked to approximately 26½×26½mm. Therefore 126 frames have around 4/5ths of the resolution of 135 35mm frames. The film has pre-exposed borders and exposure numbers. 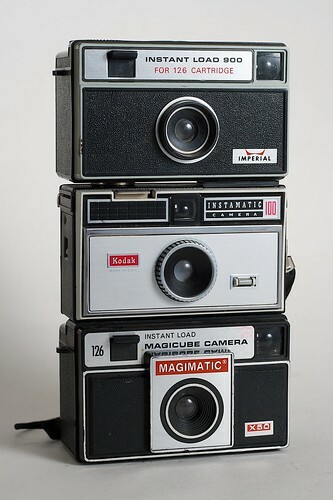 Kodak Instamatic 126 cameras were introduced simultaneously with the 126 films, followed by many more Instamatics, and the term "Instamatic" has sometimes been used generically for any camera using the format. The 126 format was in some ways a revival the ailing 828 roll film format introduced by Kodak in 1935 (along with a range of Kodak Bantam cameras). Both used paper-backed film 35mm wide, with only a single registration hole per frame. However the 828 image format was 28×40 mm, not square. The decline of the format didn't originate from a lack of cameras in circulation but from the fact that 126 cameras were generally cheap, low end units which were easily superseded long before the arrival of the digital era. Some quality 126 cameras were produced including SLRs but they were rare in absolute numbers. The square nature of 126 exposures discouraged their uptake in professional fields and meant film developers often made prints very small to fit within the 4" high photo album threshold of 6x4" prints and to counter the blur caused by the slow shutter speeds and inadequate lenses usually found in these cameras. More and more 35mm cameras with eased film load mechanics were issued by camera makers so that the 126 cassette's easy-film-load advantage became negligible. 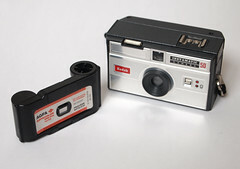 The fans of the simple image quality switched from cassette film to single-use cameras. Thus Kodak finally ended the cassette film era in 1987 with the Kodak Fling which was one of the first modern single-use cameras, based on 110 film, the small brother of 126 film. 126 cassettes were last produced in 2007 by Ferrania with only old (i.e. freezer-preserved) stocks still for sale today. 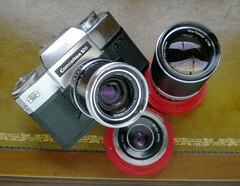 Some are available under Ferrania's own Solaris label while others are sold rebadged as Adox Adocolor Instamatic by Fotoimpex. 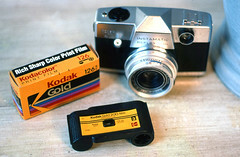 These cartridges contain ASA 200 film but there are user reports of them having ASA 64 notches. It is challenging to adapt 126 cameras to use conventional 35mm film, although there have been a few successful attempts. This page was last edited on 20 December 2018, at 11:45.